Update: Navy 49 Virginia 7. It was a blow-out for the Midshipmen, greatly eclipsing the 1.5 point spread in Las Vegas odds. 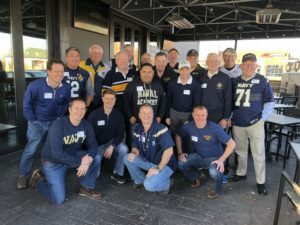 We had good attendance at Coaches: Vic Hurlbert ’10, Craig Elmore ’69, John O’Neal ’65, Jack Rush ’73 (& grandson Elliott), Chuck Stevens ’73, Eric Carlson ’74, Kyle Martin ’74, Bob Culler ’74, George Jackson ’79, Shogo Cottrell ’93 (& Lizabeth), Mike Gochis ’90, Greg Shuey USAFA ’68, and Vic Herrera USAFA ’84. We will have door prizes so please bring some cash to buy $1.00 raffle tickets. Similar to Army-Navy, we will raffle them off during the first half and at halftime. Wear Navy spirit wear. 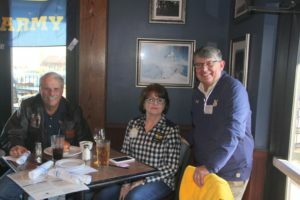 We don’t do fundraisers, so chapter dues are critical to our financial success. 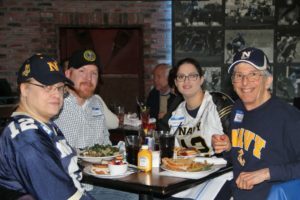 We use those dues and the raffle monies to host events like this watch party, help our KC area Blue & Gold officers guide future USNA candidates and support local college career events. 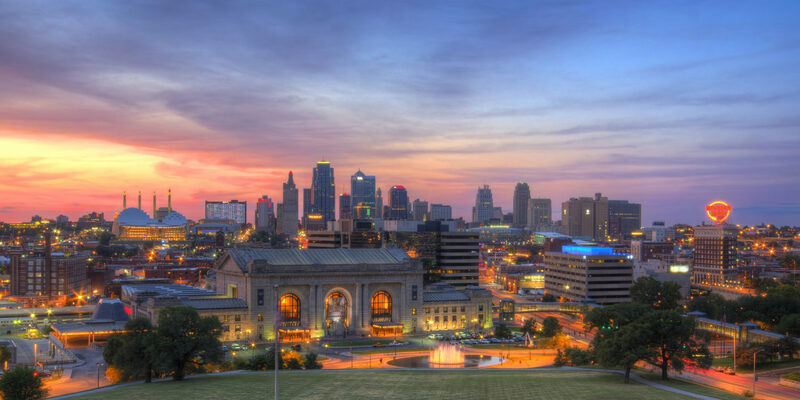 Jack Rush, chapter Treasurer, will be there if you want to pay your $25 2018 KC local chapter dues. 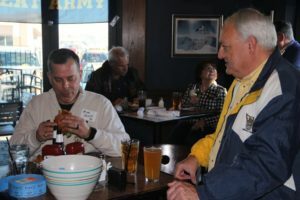 bob.culler@1974.usna.com or text 913 488-6319. Indicate the number in your party so we can get enough space. 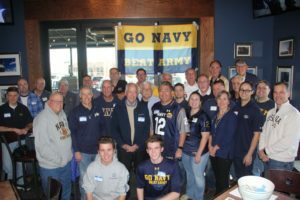 Go Navy, Beat Virginia! 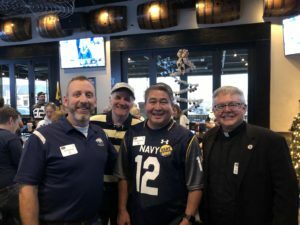 – Go Navy, Beat Army! 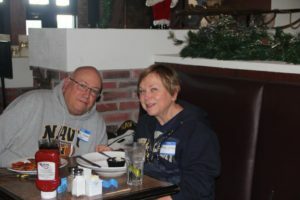 The 2017 Army Navy Watch Party was held at the Blue Moose Bar and Grill on 135th Street in Overland Park on Saturday, December 9 at 1:00 PM. 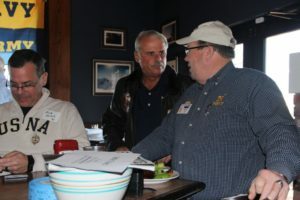 A total of ~30 alumni and ~80 total attended. Army edged Navy 14-13 on a missed last second field goal by Navy. 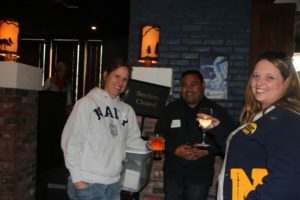 Navy/USNA logo’ed souvenir gifts and shirts were raffled off in the 1st half and at halftime. 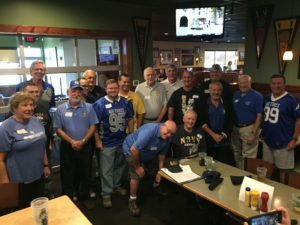 Jack Rush, chapter Treasurer, collected 2018 chapter dues. 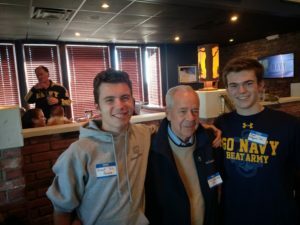 Captain Jim Coopersmith ’62 and new appointees Ernest Pereira and Ryan Fitzgerald both will be Class of 2022. A sixty year span in the link in the chain. 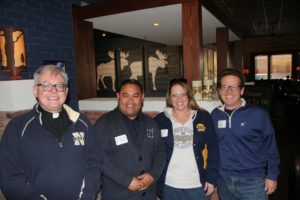 Sara Alcock Northwestern NROTC ’88, Rolando Salvatierra ’98, Beth Ann Thomas Vann ’98. Bryan Didier ’91, at the table of Chuck Stevens ’73. Professor Frank Rokosz, Wichita State and his family. 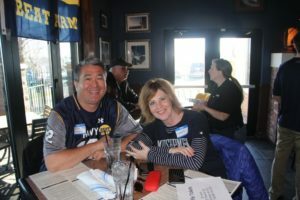 Navy football fans. Read this article on the game. 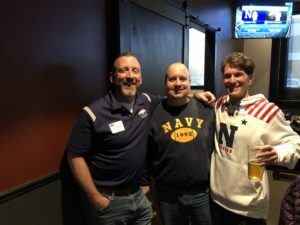 It may be the best all time Navy Air Force game, in terms of a Navy win. 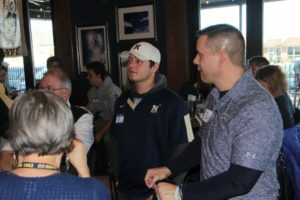 We had 10 USNA and 8 Air Force Academy Alumni attend with family members. 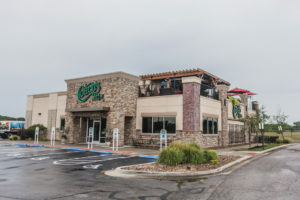 Lunch: Lunch is on your own off Coach’s menu but recommend arrival at 1:00-1:30 PM to get your food/drink order in before kickoff. RSVP: The private room reserved (upper right picture in attached bulletin) will hold 42. RSVP by October 2 please.